Arnold Scaasi Florales Seidenkleid Größe 6. 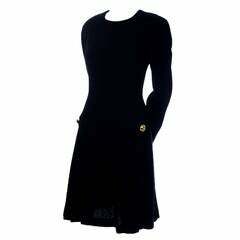 This all occasion Arnold Scaasi black dress is similar in weight and feel to the rayon knitwear favored by the St. John brand. It zips at the back with a simple sheath silhouette anchored by a shoulder line enhanced with pads and jazzed up by fishnet sleeves and large decorative gold tone metal buttons. It’s a great option for daytime to evening wear and packs well for travelers. Very good vintage condition. SIZING & MEASUREMENTS The dress is marked a size 4 and fits true to size. The following measurements were taken without stretching the fabric though there is plenty of stretch. The silhouette of the design best suits narrow hips. 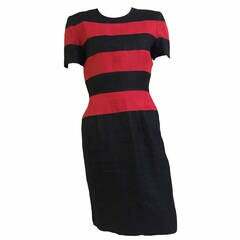 Bust 36" Waist 36" Hips 36" Sleeve Length From Underarm to Cuff 17" Shoulder Length Taken Across Back From Sleeve Seam to Seam 15.5" Length From Shoulder to Hem 40"